For generations, women residing in the villages of Punjab, India have woven the khes as a part of the trousseau that they take to their future home. With bold, harmonic and imaginative colour patterns, it is requisite as a coverlet while sleeping. Khes is a floor spread and bed covering that is traditionally made of cotton. The thinner ones are used as bed coverings in winter and the thicker ones are used in place of shawls during winters. It is a household craft and is mostly woven by the women folk for their daughters, as an article for dowry. According to his­torians, weaving is traditionally thought to have developed from mat making which have simple geometric patterns, sometimes braided and sometimes just coiled. Impressions of evi­dently similar coiled mats are found on the bases of pottery vessels from the Indus sites as early as Neolithic times. These recurring designs give fresh evidence of the remarkable survival of cultural patterns in Punjab. Khes was evolved centuries ago during the Mughal period to meet the demand of a cot­ton blanket. Before the import of ma­chine made goods from Britain and Europe in the mid nineteenth century, small scale cotton industries in Gambat, Hala, Nasarpur, Thatta and Karachi, all in Pakistan, were known for their hand looms. 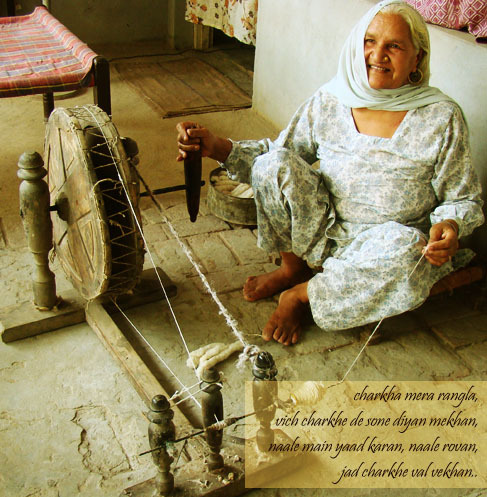 Hand spinning was prac­ticed and the thicker phulkari fabrics, khesare living examples of it. Cotton as we know has been grown in abun­dance in the plains of Sindh and Punjab for centuries and the climate has dictated the use of light weight cotton textiles for summers and the thicker ones for winters. Cotton was used in almost everything from clothes to furnishing items and thus formed an intrinsic part of the life in this region. Khes continues to be woven with traditional geometric patterns on a pit loom using twill or plain weave. The main field is filled with small repeating patterns, usually a diamond, a triangle or a polyhedron enclosed within a square. The end borders are white and combine a number of narrow and broad stripes in complex permu­tations of the forms seen in the field. Khes are generally woven in sets of four pairs, end to end and then stitched together to produce the requisite width. A khes with two panels joined measures about 2 metres in length ad 1.5 metres in width. The most pop­ular colours are deep yellow, red, black, blue and green (white being regarded as neutral). ‘The spinning wheel with gold nuts spins colours in my life. But whenever I see it it reminds me of you and makes me cry’. Women during the evening sit together and spin while singing songs. 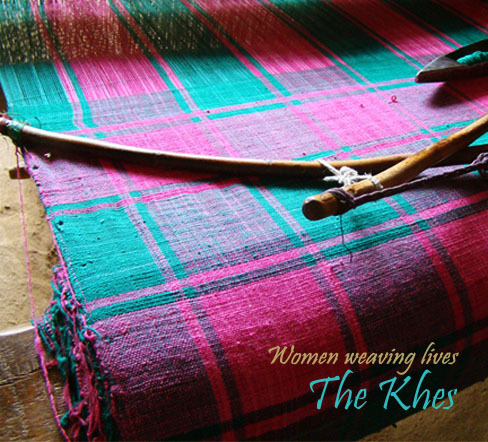 Khes weaving is originally a household craft, exclusively done by women and it has very little commercial value. A girl is taught to weave by an elder woman of the household. This is done so that the tradition does not die out and she can carry it forth.The women refuse to sell khes due to their sentimental attachment with it. Khes is therefore largely unknown to the outside world. Khes is one of the few household arti­cles to have survived the rapid transformation that twentieth century has brought to the vil­lages of India. The bride’s mother takes extra care in weaving the khes right from the beginning till the end as the dowry will be a life long possession of the daughter who will carry it to her husband’s house in a sinduk. She also nourishes her daughter who is one day taken by the suitor along with thekhes. It is therefore com­pared to the daughter and the love that the mother shares for both. Khes is thus, sym­bolically infused with life. How do we get it if we need to buy?